"Working from home" used to be synonymous with sleeping in, doing errands, and working in your pajamas, and employers only allowed it in case of emergency. That was the dark ages. Today, technology has changed everything. Thanks to internet, email, messaging applications, and video conferencing, you can be just as productive and accessible at home as you would be on-site. You can even collaborate with a team just as effectively as you would if you were all located in the same place. However, just because technology makes it possible to work remotely doesn’t mean that every employer or every manager is on board. 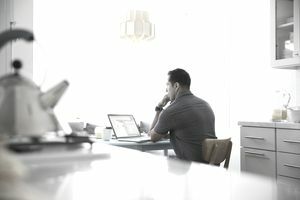 If you’re relocating because of a spouse’s job change or similar – but you still love your job and don’t want to make a change – you might need to convince your supervisor to allow you to work from home. When you do so, it’s important to emphasize the benefits to the company, instead of talking about the plusses from your perspective. Remember: the bottom line is, well, the bottom line. If you can demonstrate that letting you work from home will save or even make money for the company, you’ll stand a much better chance of convincing the boss. Everyone is available around the clock anyway with smartphones, meeting technology, virtual office software, and other remote options; the days of being changed to your desk, let alone your office, are over. While employees benefit from the flexibility of working from home with a better work-life balance, allowing workers to telecommute can also save the company money. From real estate costs to snacks in the breakroom to subsidized commuting, not having you in the office can make a real difference in terms of costs to your employer. Before you speak with your manager, tally up these savings. There’s little more persuasive than dollars and cents, especially to budget-conscious supervisors. Telecommuting workers are actually more productive than their colleagues confined to an office, plus they report more job satisfaction. A Stanford study showed that working from home added up to an extra day of work over time, due to the fact that commuters lose hours to being late or leaving early. The same study showed that remote workers took shorter breaks and less time off than their colleagues in the office. Unsurprisingly, they also used less sick time, probably due to less exposure to sick coworkers. To seal the deal, ask for a trial period. A reasonable boss likely won't argue with that – again, especially when the cost of recruiting and training someone to fill your role will be far higher. Then, do your best work during that trial period. Be proactive about communicating with your boss and teammates about your schedule and availability. Be accessible via all the usual means of communication, including email, Slack, or phone. If you work from home the right way, you’ll reduce your employer's concern about absenteeism and inefficiency that affects their bottom line. Want to ask your employer to let you work from home due to relocation? Frame your request in a letter. As you know, my wife is going to be relocating to Denver in a few months. I would very much like the opportunity to meet with you to discuss the possibility of my continuing to work for you remotely, once our move is complete. After our move, I would be available to travel to the office when necessary and would be willing to maintain very close contact on the projects underway and moving forward. I believe that my interest and experience will continue to be an asset to the company, and would appreciate the opportunity to continue to work with this fine team. Thank you for your consideration and I'm looking forward to discussing this possibility in person.